when I was little, I played a super-old DOS game called DND. it wasn’t really a D&D game (it shared the list of core stats, but not much else), OR a rogue-like (there was permadeath, but the dungeons were not procedurally generated). not that I knew about either of those things at the time, but DND got me interested in both. 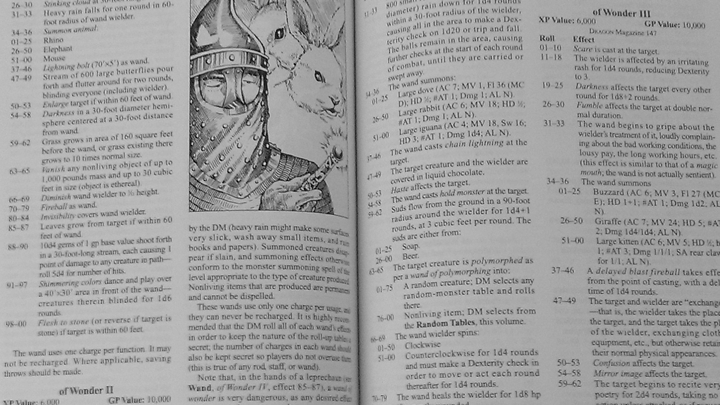 it so happened that my dad had played D&D in highschool or college (I forget which…), so he was able to tell me about it, and I was instantly interested, and began saving all my allowance money for D&D books, even though I had no one to play with. 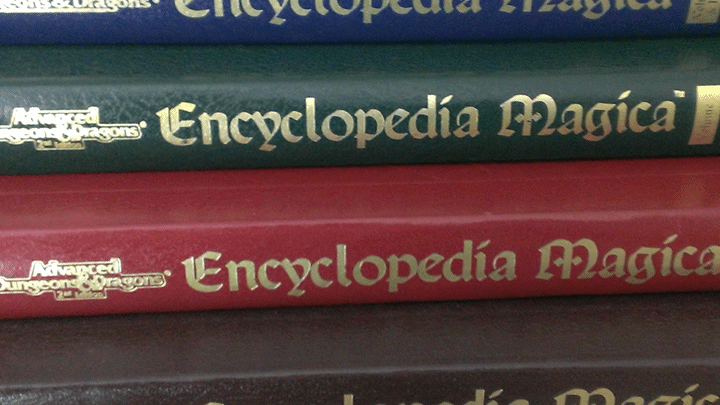 the purchase I was most proud of, and which I still sometimes use today, is the Encyclopedia Magica: a collection of four colored – and yes, I’m about to call them “tomes” – tomes. the first book is 400 pages of magic items, and each subsequent book is longer, with the fourth being 1500 pages (excluding the index)! I was going to write something like “from the FIRST ITEM IN THE FIRST BOOK to the LAST ITEM IN THE LAST BOOK, bla-bla-bla, a wealth of ideas,” but the first item is the first book is the “Abacus of Calculation”, which is probably among the least-inventive things you could come up with. the Wand of Wonder is perhaps one of the more (in)famous items in D&D. you point it at whatever you want, and roll a 100-sided die (or, more likely, two 10-sided dice) to determine what happens. sure, it might shrink the target to half their size, or throw a lightning bolt at them, but it might also just summon a swarm of “attack butterflies (no effective attack)”, cause the target to uncontrollably recite bad poetry, or cover the both of you in warm, gooey chocolate. the reason I love these books today is that the entire collection acts as a sort of wand of wonder. if I ever need a ideas – be it for a table-top role-playing game, or a video game – I can just open one of these up, and flip around. and right now, I find myself with a problem: I need more unique “blessings” and “curses” to give to equipment in Mysterious Space, but am running out of ideas. many of them are just variations on existing mechanics, but something DIFFERENT would really make the system stand out. Noora’s ring is similar in many ways to a standard ring of djinn summoning. Noora’s ring, however, will summon a tasked artist genie known as Akmed. Akmed is a skilled weaver and can produce some of the finest cloth, fabrics, and rugs ever seen in Zakhara. Akmed often gives his work to Noora so that she may present them to others as gifts. Noora uses these gifts to solidify alliances, reward services well done, or simply as tokens of friendship. that is both a weirdly-vague and also weirdly-specific item. most old-school D&D items will be like “you can use it only three times a day, and not for more minutes than you roll on two six-sided dice, and you can’t use it along with this other item in order to do bla-bla-bla”. also, I don’t think most of them tell you what their OWNER might use it for. we may have learned as much about Noora as we did her ring! but those kinds of details are actually really cool! I’m kind of happy about how non-D&D this item is… like, it COULD have just been a magic stone that you put on the ground, and a rug appears under it, or whatever. similarly, in Mysterious Space, I COULD make an item that just creates another item without explanation, and I doubt anyone would think twice about it. but what if, instead, using the item causes some broken alien AI hologram to appear, all like “he–o Noora. –t can I –p you wi– –oday?” and you pick from a menu of broken options, and you get a random one of the selected things. THAT would be way cooler. not quite the inspiration I was expecting – I’m, again, more-used to D&D items with layers upon layers of rules and dice rolls, and maybe even tables – but hey: I’ll take it!